bdh+young formed a year-long partnership with the Cystic Fibrosis Foundation to raise awareness and funds in support of those affected by cystic fibrosis (CF), a genetic disease that causes persistent lung infections and limits the ability to breathe over time, eventually leading to respiratory failure. More than 30,000 people in the US are living with CF, and approximately 1,000 new cases of CF are diagnosed each year. The bdh+young team wants the people living with CF – moms, dads, sisters, brothers, daughters, sons, friends and co-workers – to have more tomorrows! On September 22, bdh+young is participating in the Cycle for Life, a unique event that empowers cyclists to take action and demonstrate their fight in finding a cure for CF. 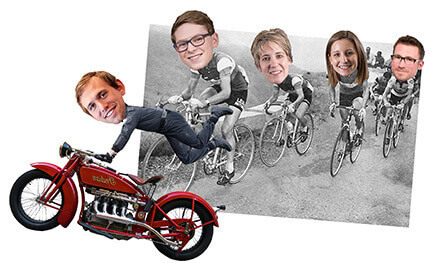 The bdh+young cycle team is comprised of five designers passionate about fighting for a cure: Todd Mulvihill, Eric Mayer, Mikale Nafe, Beth Nordstrom and Amy Schluessel. Although tremendous progress has been made toward finding a cure for CF, the lives of those living with CF are cut far too short – The median survival age is close to 40. You can help the bdh+young cyclists achieve their fundraising goal by clicking here to make a donation. By donating to the cause, you are helping add tomorrows to the lives of people living with CF by supporting the search for a cure.